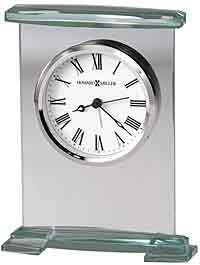 The Howard Miller Colton 645-799 Alarm Clock may be used as an alarm or handsome tabletop clock. 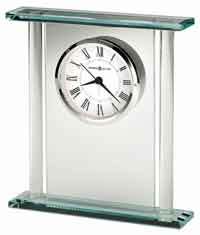 The gently arched glass tabletop alarm clock is decorated with smooth, round glass beveled pillars and a beveled base. The white dial has easy to read black, modern Roman numerals and a flat glass crystal above the dial, There is a polished silver-tone bezel around the dial that has a black hour, minute and second hand and a silver alarm hand. Quartz, battery-operated beep alarm movement includes one AA sized battery. 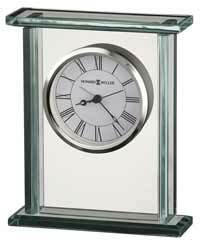 Clocks for sale at The Clock Depot including the 645-799 at discount prices.